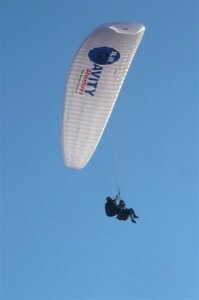 Tandem flights will be available at the sites we do fly aways at fly such as Bambi in Mphumalanga. 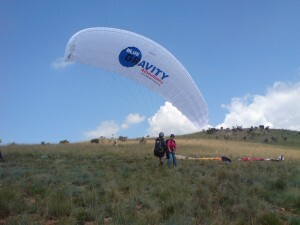 Blue Gravity only offers legitimate instructional flights using the TFI System to people whom accept that their intention is to experience the flight with a view to possibly taking up the sport of paragliding. A person can become a member of SAHPA for the day with a view to the passenger showing interest in learning to fly paragliders in the future. Anyone can do it! The only limitation is weight and running ability. 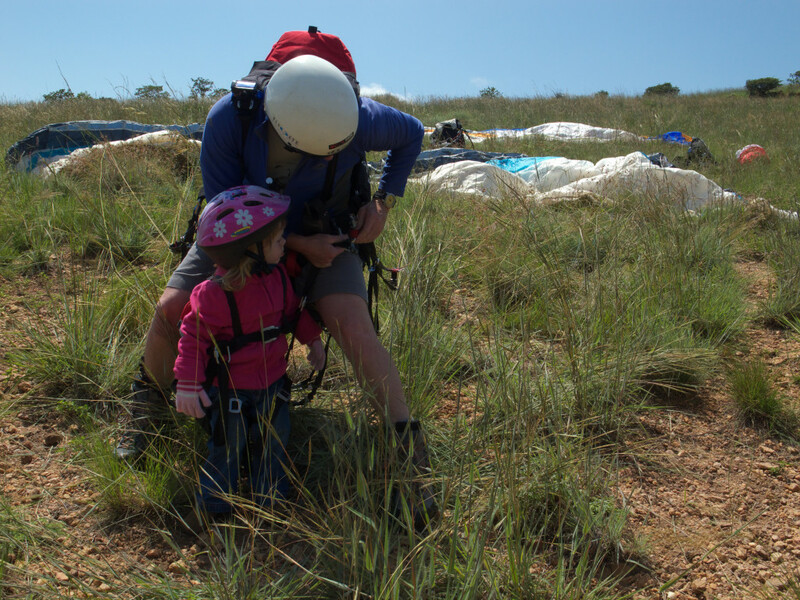 There is no minimum or maximum age for flying on a tandem paraglider, though children under 18 years old will need their parents’ consent. However for purposes of instruction we can only accept potential students from 14 years of age. Your pilot will guide you through the whole flight and provide the basic training to complete an initial Tandem Instructional flight. We have a weight limitation of 40kg-90kg . These Photos below show Kev flying his daughter. 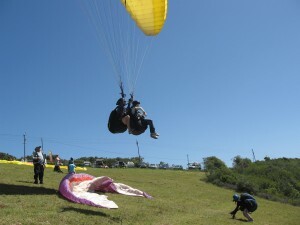 Please note any form of paragliding may affect your medical aids cover and any insurance policies you may have. If you partake you you do so in this knowledge. All training flights are weather dependent and we reserve the right to curtail any flight for safety reasons. 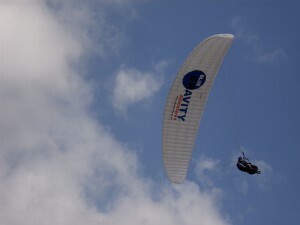 Your pilot will be TFI rated and is highly trained to ensure your safety during all phases of the instructional flight. Long pants (jeans) and long-sleeved top (sweater or jacket). Hiking boots with ankle support preferably (otherwise just normal closed running shoes). These must be supplied by the potential student. You will be given a helmet to wear. You will be securely strapped into a comfortable flying harness. To get airborne you will need to run briefly during launch. On landing you stand up out of your harness and prepare to run. 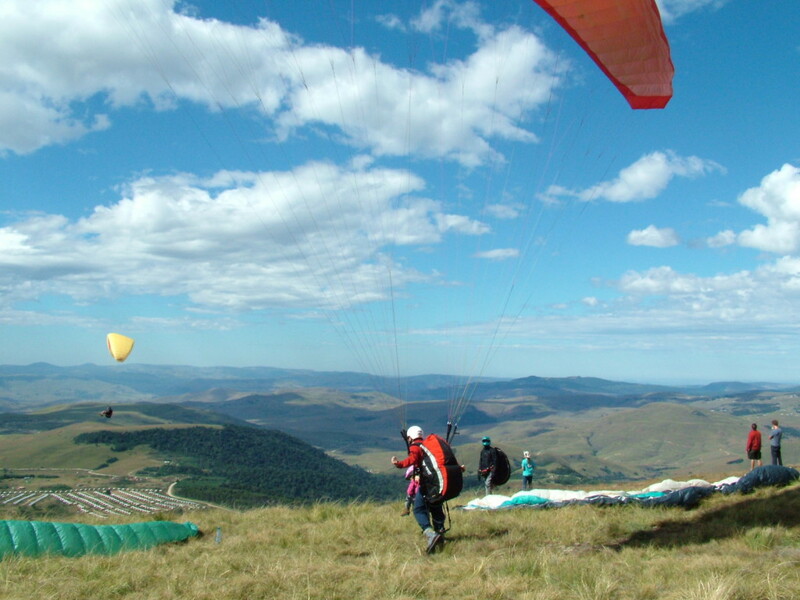 During the flight you can relax and enjoy the view from your bird’s-eye perspective and experience how to fly a paraglider while under expert instruction . Pure simplicity and freedom is the true beauty of paragliding. 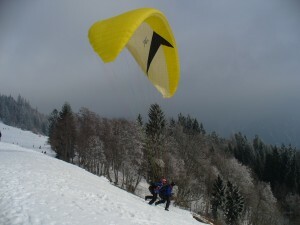 Within minutes you and the glider can be ready and in the air. It is a truly awesome and unique experience! Flights are undertaken only with favourable weather predictions and access to the launch sites on our fly aways and events.